The Lady Trojans enter the 2017-2018 campaign under new leadership. Jeff Dittman, who served his 20th head coaching season a year ago, stepped down and brought in two new, but familiar coaches, David Moe and Jamal Branco. David Moe was hired in as the Head Coach following a ten-year stint with conference foe, Mayville State (ND). Coach Moe served as the Women’s assistant for the Comets, where he was a part of numerous National Tournament appearances as well as a few top-20 rankings in the National Poll. Moe, an alum of Mayville State, is all too familiar with Dakota State and its programs. “Coming to Madison, it was always a welcoming community, a blue-collar town. The people I’ve seen in my many trips to Madison, as well as the fan base and support for Dakota State along with its athletics have always been something I’ve appreciated,” Moe says. He has always been fond of this part of the country. Growing up in Minnesota and being affiliated with the North Star Athletic Conference made the decision to come here a little easier. “I really wanted to be a Head Coach. Dakota State had that position available. Its proximity to Sioux Falls, as well as Brookings gives it a great location”, he continued, “Coach Dittman proved that you can have success here, and that’s something I hope to maintain while I’m here.” Coach Moe sees the NAIA as a dream job, noting that it is more about the players than the NCAA, and that is something that he enjoys. He added, “The opportunity to give scholarships, recruit players that are passionate about the game makes the NAIA a great place to work.” His passion for the game stems from his dad, who spent 35 years in the coaching world. He says his passion really took off when a coach impacted his life, and hopes to leave a similar print on the girls he coaches today. The goal Coach Moe has while he is here are simple, to leave a legacy. “In the end, I want to leave and know I was successful in my time here. I want to develop character in these kids, I want them to leave here and say that they are better basketball players, and more importantly better people, when they move on in life.” Coach Moe spends his time either in the office or at home playing with his three daughters. He also enjoys a good cheeseburger and loves Queen, Billy Joel and Sinatra. Coach Moe has the Lady T’s off to a 3-5 start after their game with Bethany Lutheran College (MN) on Tuesday Nov. 21. Another new face alongside Coach Moe is his assistant, Jamal Branco. Branco, in his first year as an assistant in college sports, spent four years playing for Mayville State (ND) where he got the chance to meet Coach Moe. “We just talked life, we turned out to be the same person. He had talked about how if the opportunity came for him that he wanted me to join him, I always thought he was kidding.” Coach Branco found out first hand that it wasn’t a joke and now finds himself embarking on his first season as a coach. Following graduation from Mayville State, Coach Branco headed back to his home state of Florida to “teach Kindergarten through Eighth grade and sit on the beach”, thinking to himself he wouldn’t have to return to the cold weather, at least not this soon. Coach Branco adds that his liking of Madison comes from the people, the support for DSU and its athletics, and Dairy Queen. He has become very fond of the local fast food chain as he has a weak spot for the #6 chicken strip basket. He also feels that he is right where he needs to be, saying, “the assistant position is where I’m comfortable. The head coach spot has harder decisions that I’m just not experienced enough to handle it all right now.” Coach Branco also mentioned his love of Netflix, especially if it’s paired with a meal from Dairy Queen. As for music, he said that he and Coach Moe both enjoy listening to the song “Glorious” by Macklemore. 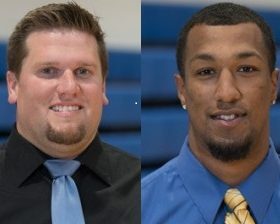 Good luck to both Coach Moe and Coach Branco as they begin their journey with Dakota State and the Lady Trojans.